How Employee Recognition Helped Make American Advisors Group a "Top Workplace"
American Advisors Group needed a recognition program to reinforce their core values, while giving employees the ability to personalize their messages and make recognition more meaningful to the recipient and the organization at large. TemboSocial provided American Advisors Group with a secure, enterprise solution integrated inside their Intranet that enables employees to build their reputation and to share stores of success and achievement that drives business success. 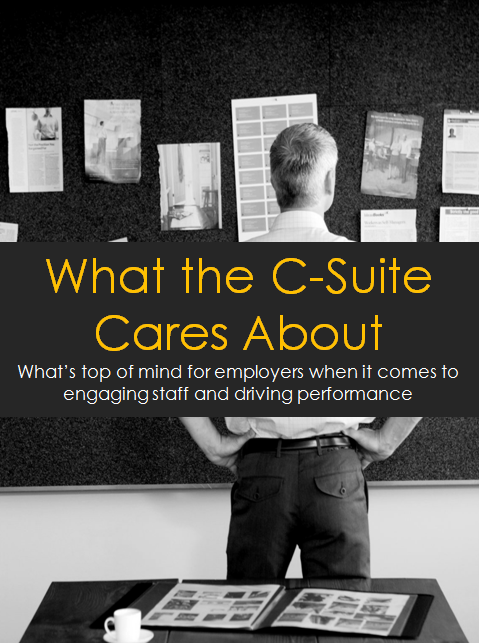 We surveyed 1,600 employers who shared their biggest pains about evaluating HR technology, how to use data to make change, and their perspective on company culture and employee engagement. Download this toolkit to discover the 5 elements that should be part of your 2018 employee engagement strategy. 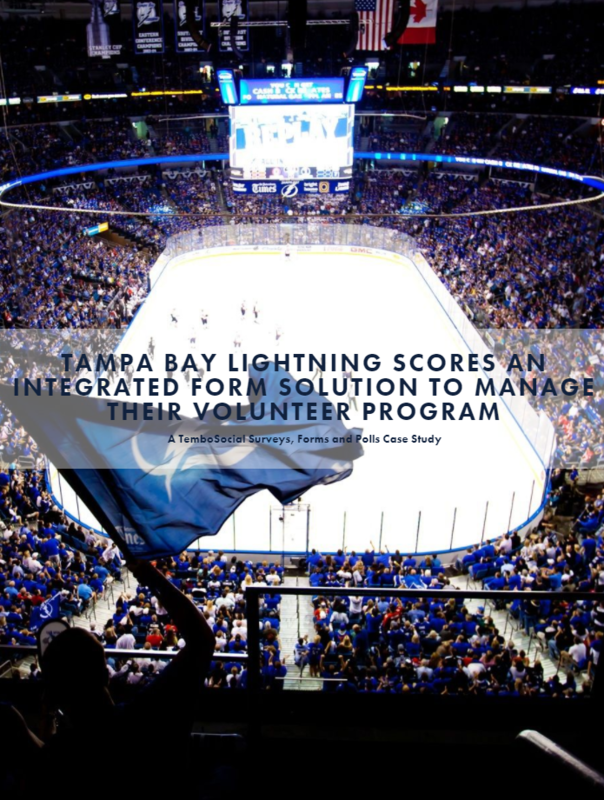 Tampa Bay Lightning needed an integrated form solution to manage its volunteer program, while leveraging their investment in a new Jive Intranet environment. TemboSocial was able to provide Tampa Bay with a solution that has saved significant time and resources managing the program and even boosted employee participation. Get your copy below to learn more. Ricoh looks to differentiate itself in the market through its outstanding approach to customer service. 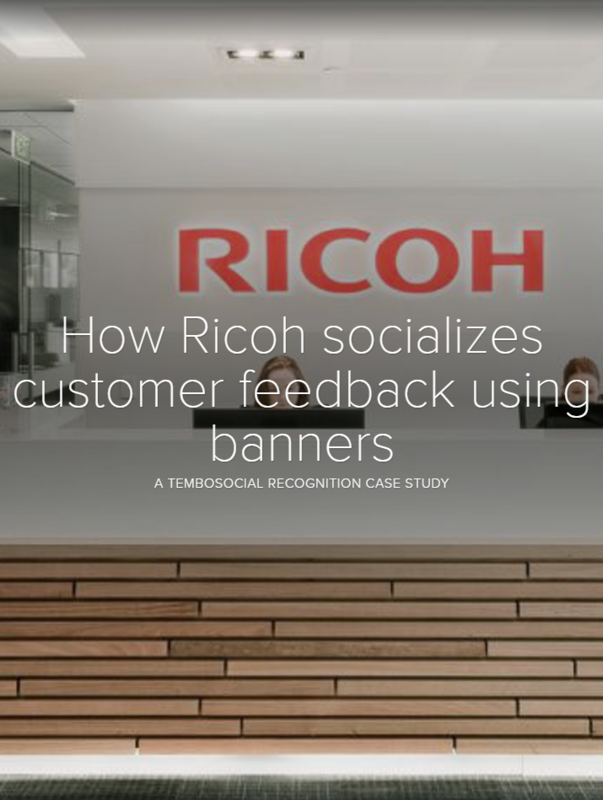 As part of this strategy, Ricoh wanted a solution for highlighting and sharing positive customer experience feedback across the organization. Learn how they did this through TemboSocial Recognition and integrated Banners throughout the Intranet. 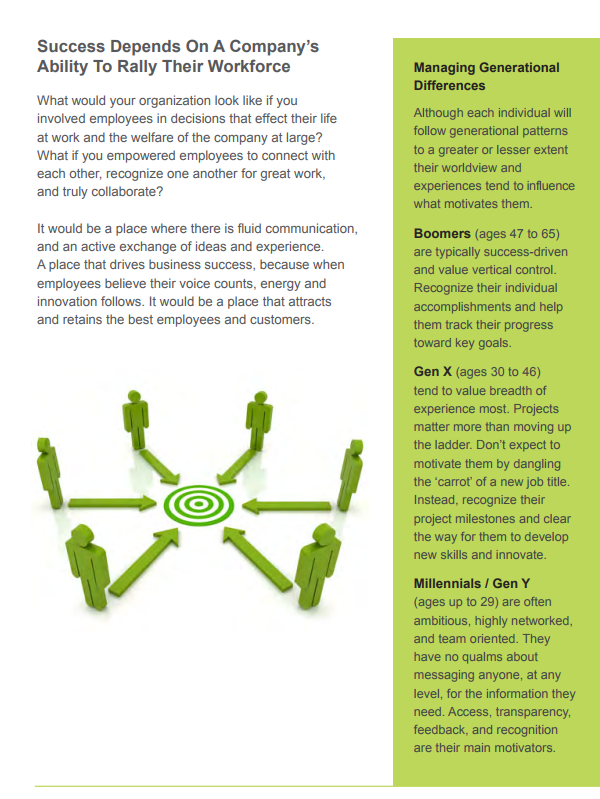 Plus discover the extremely positive response from employees. 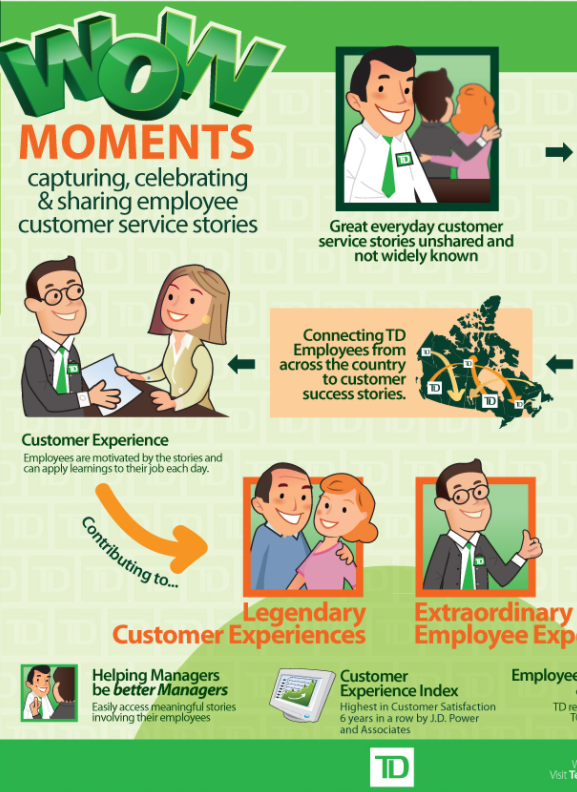 An employee’s personal legacy is the sum of their contributions, large and small. Encouraging personal legacy through social recognition has a powerful ripple effect, one that propels enterprise success. 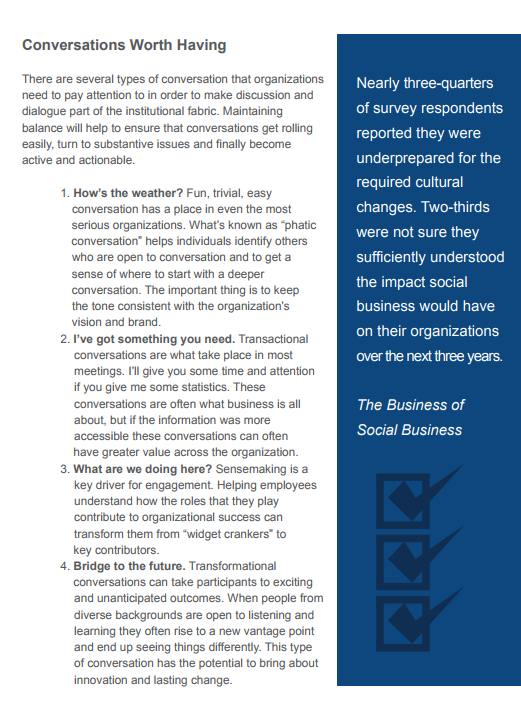 Allow your employees to share, celebrate and infuse success stories into the corporate Intranet. The right social recognition program unleashes social and intellectual capital. It leverages an organization’s people and their stories, builds networks, enhances connections between employees, and transforms recognition into a valuable asset for employee development and collaboration. 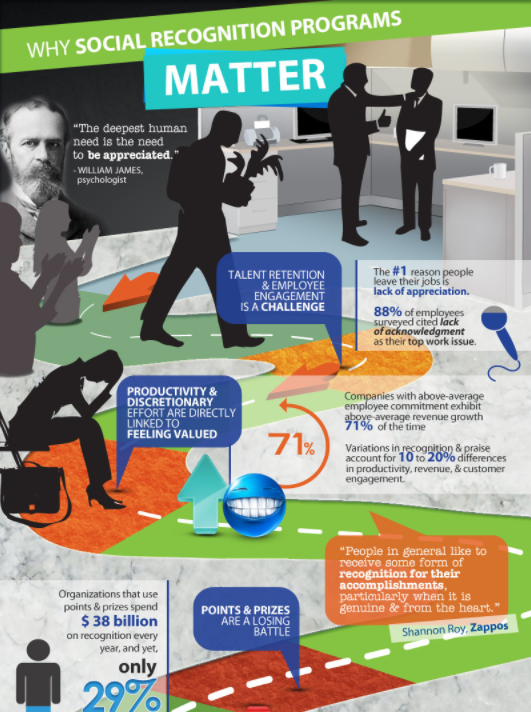 The #1 reason people leave their job is lack of appreciation. 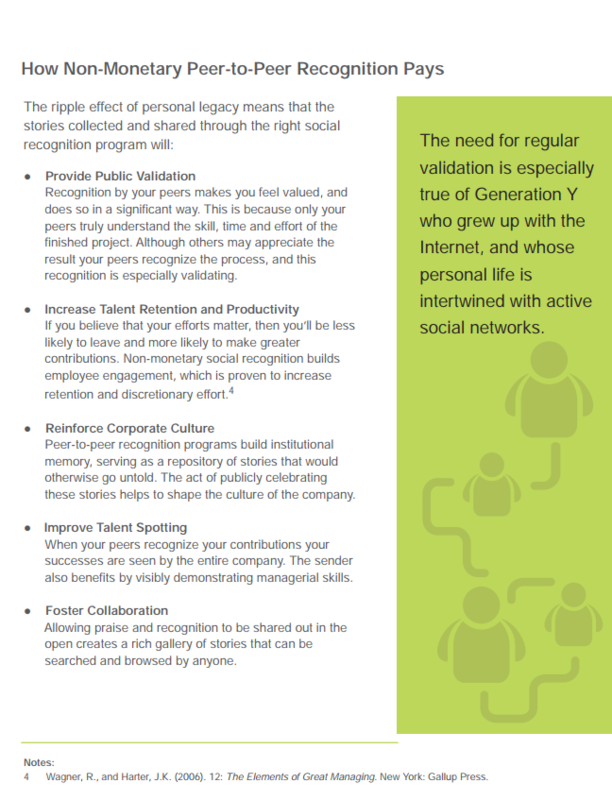 This infographic illustrates why social recognition programs matter and the power of peer-to-peer recognition. 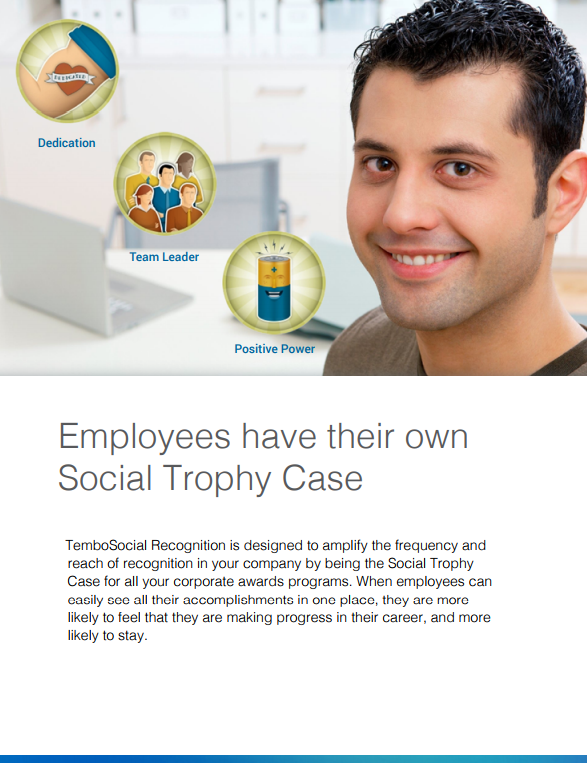 Learn how the right social recognition program increases employee motivation and retention. The management and promotion of annual enterprise awards programs has always had its share of challenges. Nomination volumes are low year after year and the end-to-end management of the awards process is time consuming and torturous. But it doesn’t have to be this way. This guide will help you understand the five keys to successfully modernize your enterprise awards program. Every enterprise is social. Buying, selling, trading and negotiating are all social activities. Somewhere along the line as businesses grow, communications begin to break down, workgroups become silos, and customers become numbers. Discover the tools and strategies that will help your organization reduce the distance between your employees, improving collaboration and boosting productivity. 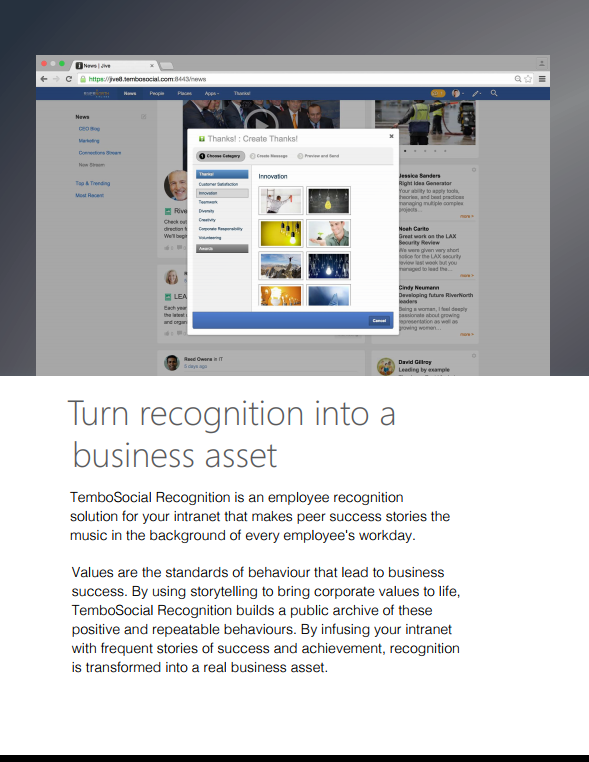 By making employee appreciation highly visible and available in SharePoint and Office 365, TemboSocial Recognition creates meaningful content that keeps people engaged. Motivating and retaining talent while driving sustained platform adoption is the ultimate win-win. Learn more in the product brief below. 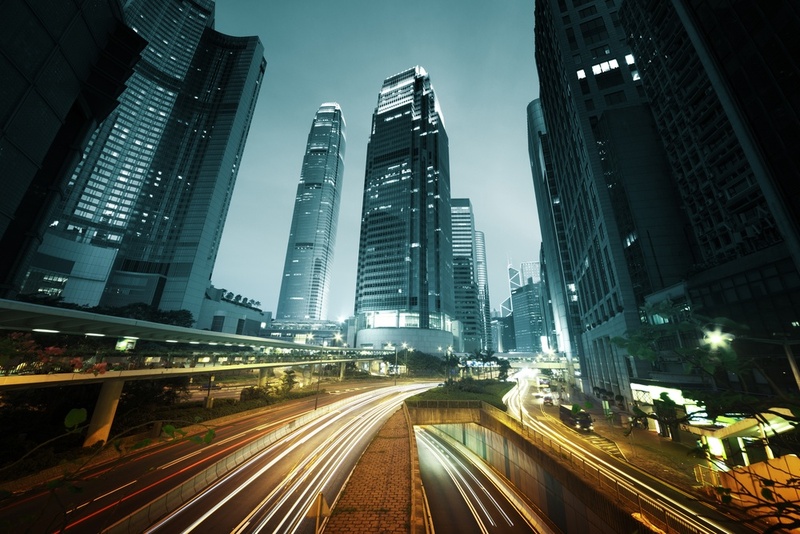 IBM Connections provides the full-featured social business platform your organization needs. Bring even more value to your Connections investment with TemboSocial Recognition: a full-featured social recognition solution. Drive platform adoption while capturing, celebrating and reinforcing desired behaviours that positively impact your customers and colleagues. Leverage your Jive Intranet investment to drive platform adoption and employee engagement, while making employees smarter about company business. Read the product brief for TemboSocial Recognition in Jive to discover an integrated recognition solution that will drive performance. 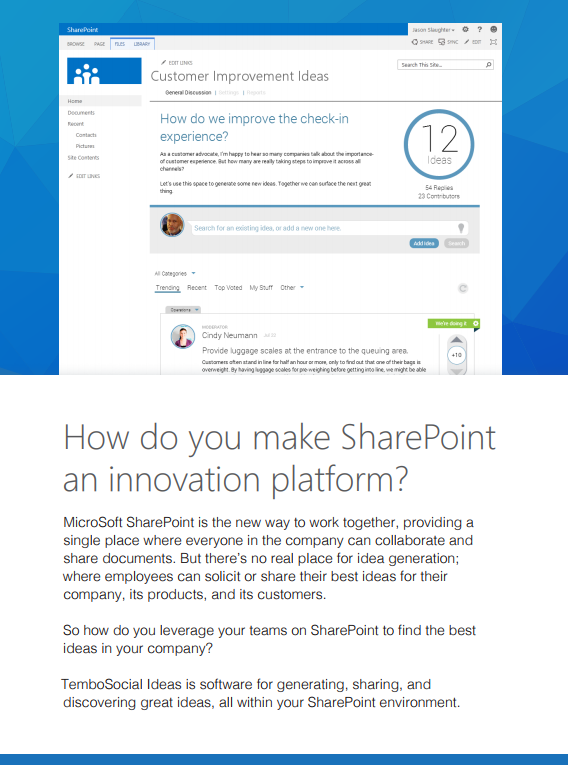 Build a space for innovation in SharePoint or Office 365. 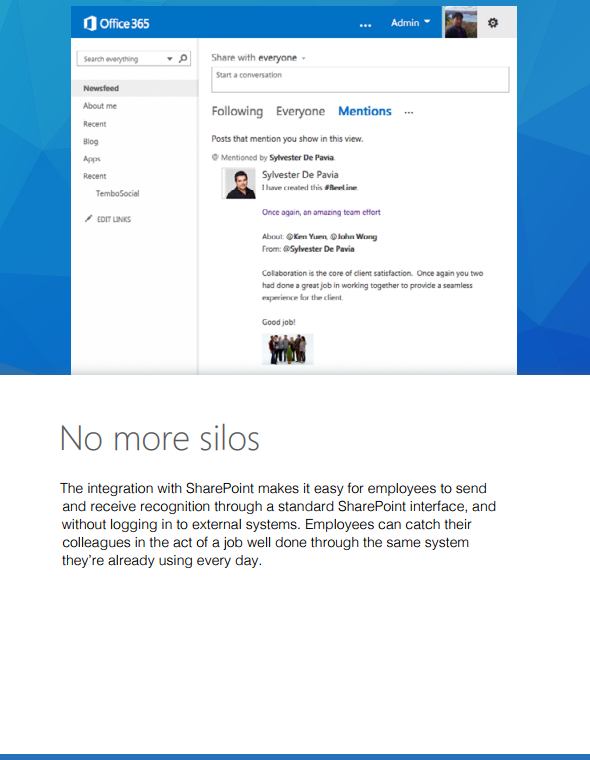 Your employees use SharePoint every day for collaboration and sharing of documents. Now that same platform can be used for idea generation with TemboSocial Ideas for SharePoint. 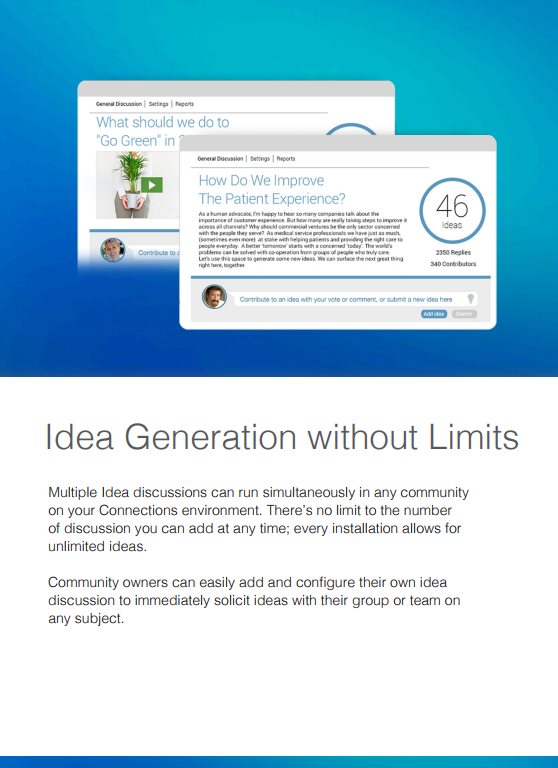 Read our product brief on idea generation in SharePoint, and bring out your company's best ideas today. Your employees use IBM Connections every day for collaboration and knowledge sharing, but with the Idea Blog, innovation takes a back seat. It's time to bring innovation to the forefront with TemboSocial Ideas for Connections, a drop-in upgrade to the Connections Idea Blog. Discover more below. Nobody in the Millennial cohort expects the world to change just for them. But the organizations that can hold the attention of millennials will be the ones that can hold a conversation. 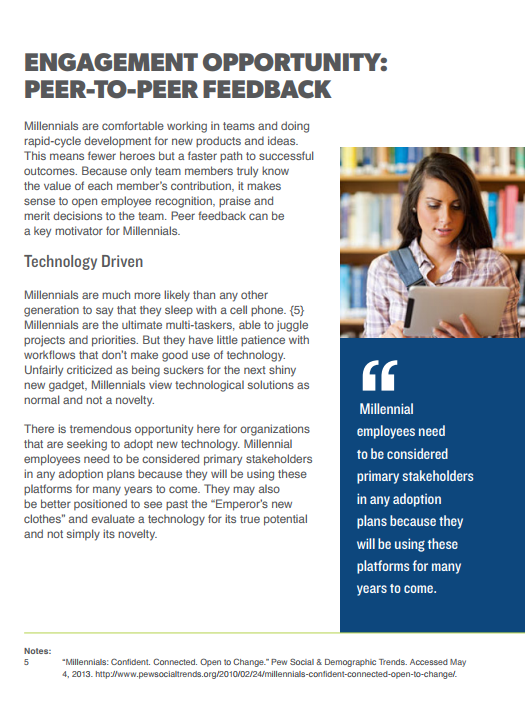 Download this white paper to learn what really motivates millennials and the impact the right social recognition program can have on millennials. Staff who are engaged in their work, committed to the mission of the enterprise and satisfied with their jobs are both more productive and more profitable. Learn about the power of conversation, the tools that will help you foster it, and the increased performance that can come as a result. Employee participation and performance leads to profits, as demonstrated by companies with high levels of engagement. What follows is our roadmap to help your organization join their ranks. 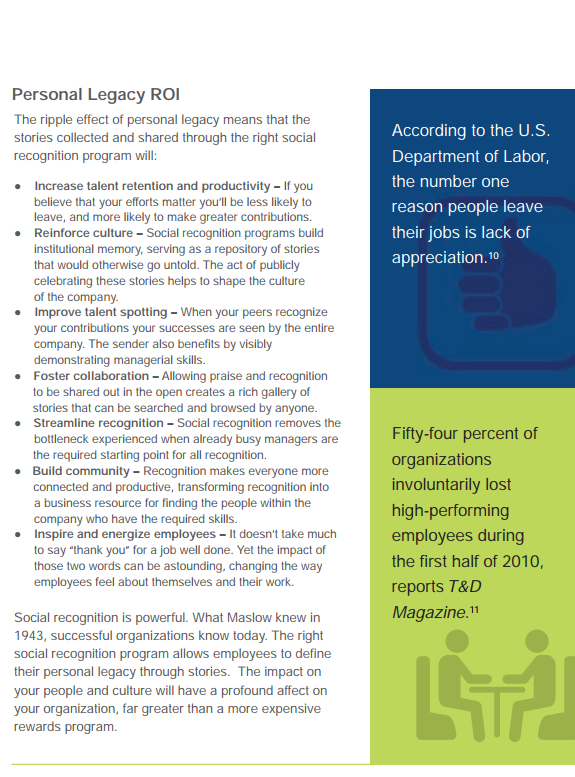 The right social recognition program increases employee motivation and retention. It also makes recognition a valuable tool for employee development and collaboration, while reinforcing corporate culture and values. 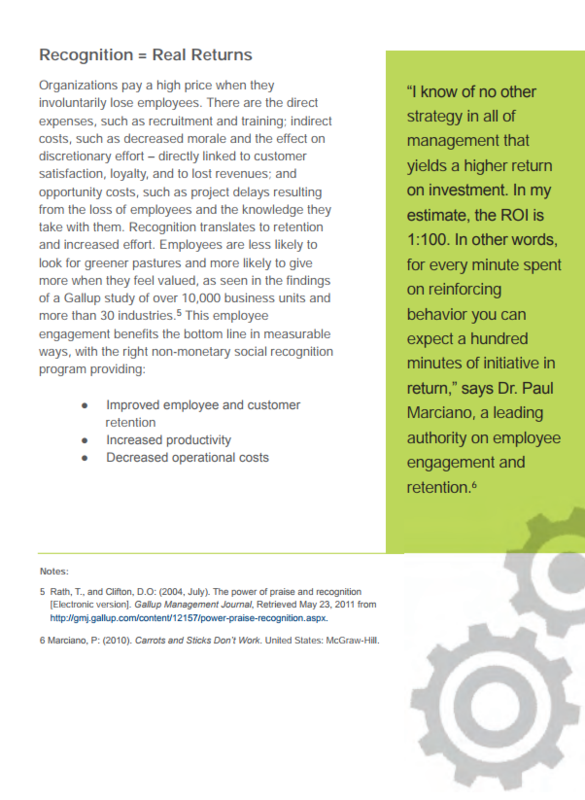 In this whitepaper, discover how a non-monetary social recognition program can provide short and long-term benefits for your organization. 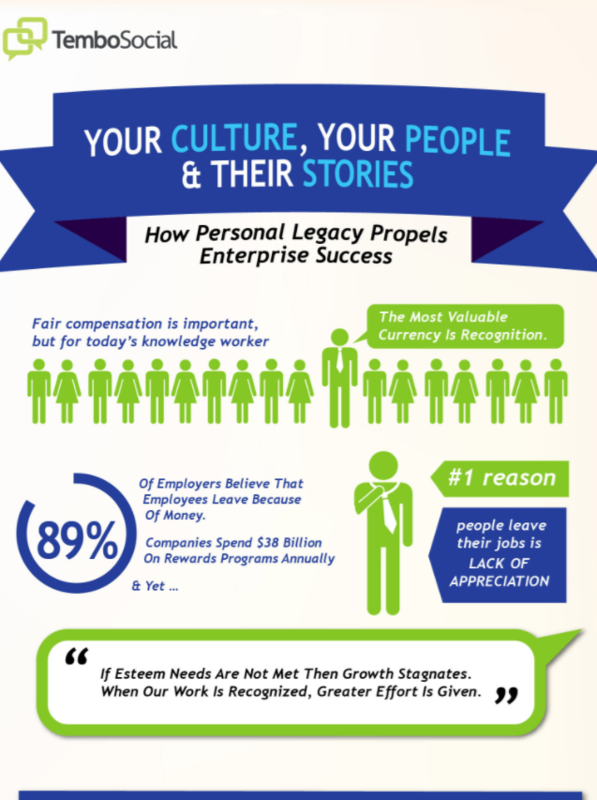 An employee’s personal legacy is the sum of their contributions, large and small. Encouraging personal legacy through social recognition has a powerful ripple effect, one that propels enterprise success. 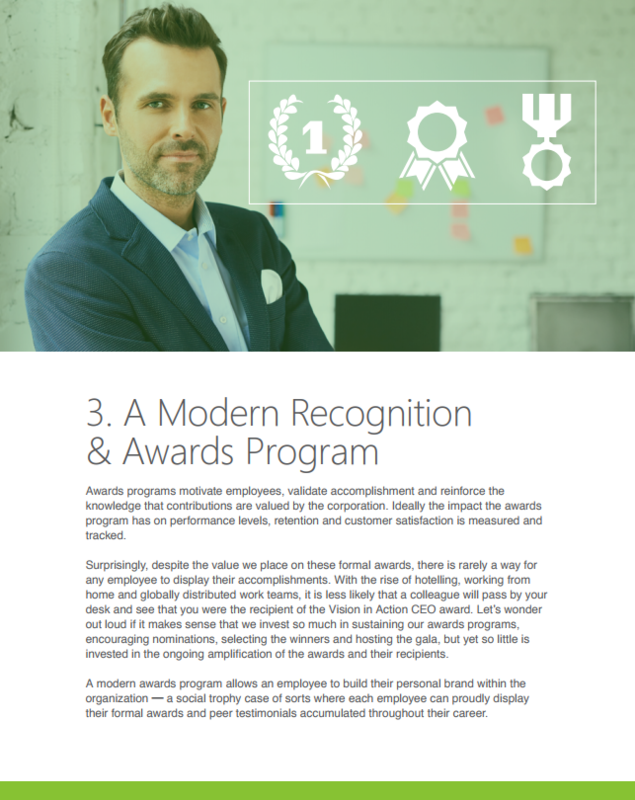 Discover what the right social recognition program can do for your employee performance and organizational success. 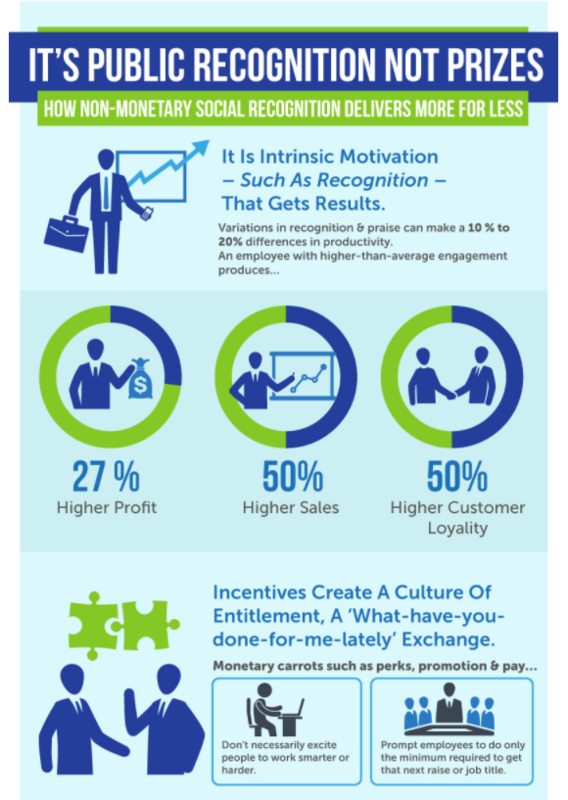 Monetary incentives don't buy workplace happiness. Perks and financial remuneration have a weak exchange rate with today's knowledge worker, for whom the most valuable currency is recognition. Read the White Paper below to discover the benefits your organization can receive with the right non-monetary recognition program. 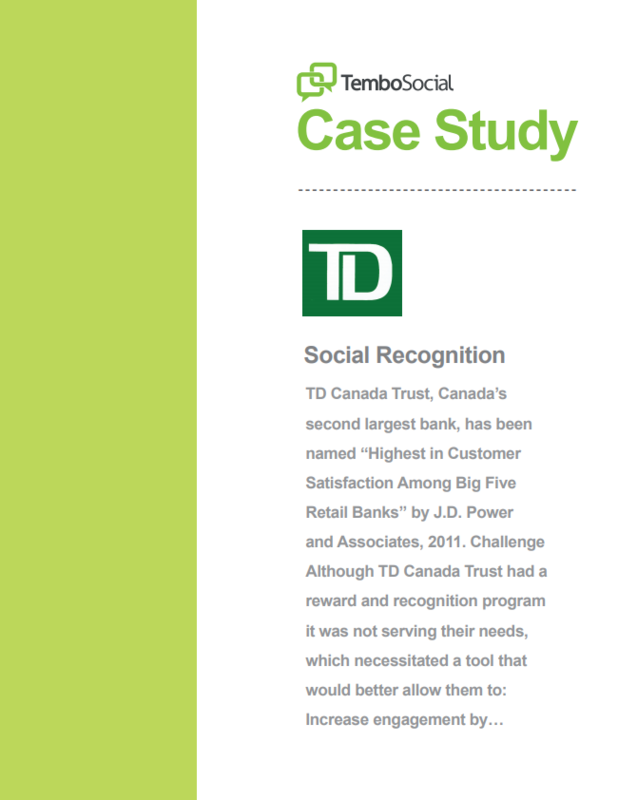 Discover the results of this transformation and how TD Bank drove adoption of its new Intranet platform. RBC's Brand Marketing group approached TemboSocial to create a space where employees could share their “Somedays” on the company Intranet and where they could enter to win daily prizes. 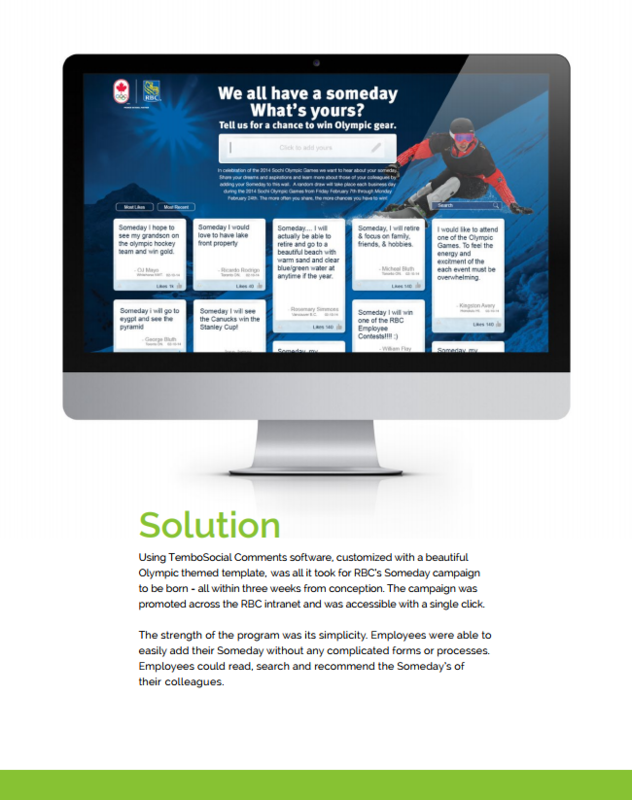 Leveraging TemboSocial Comments, RBC set out to capture the Olympic spirit visually and experientially by creating an active community where employees would share their own Someday hopes and dreams and connect with co-workers from across the country. Three associations with their own deeply rooted cultures merged to create Workplace Safety & Prevention Services (WSPS). An initial employee survey revealed that employee recognition had suffered during the merger. 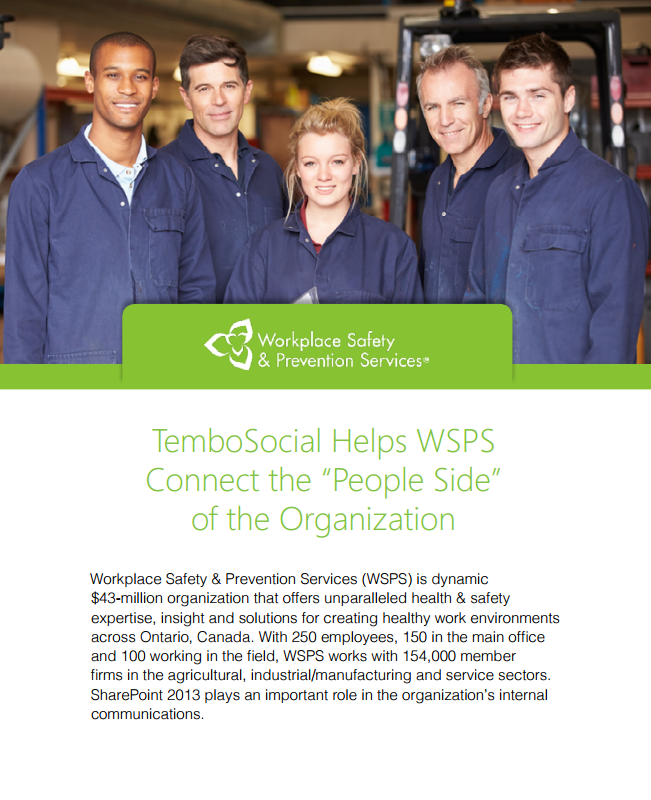 Learn how TemboSocial helped WSPS develop a strategy for using employee recognition as a tool inside SharePoint to bring the different cultures into a single conversation around achievement and accomplishment. 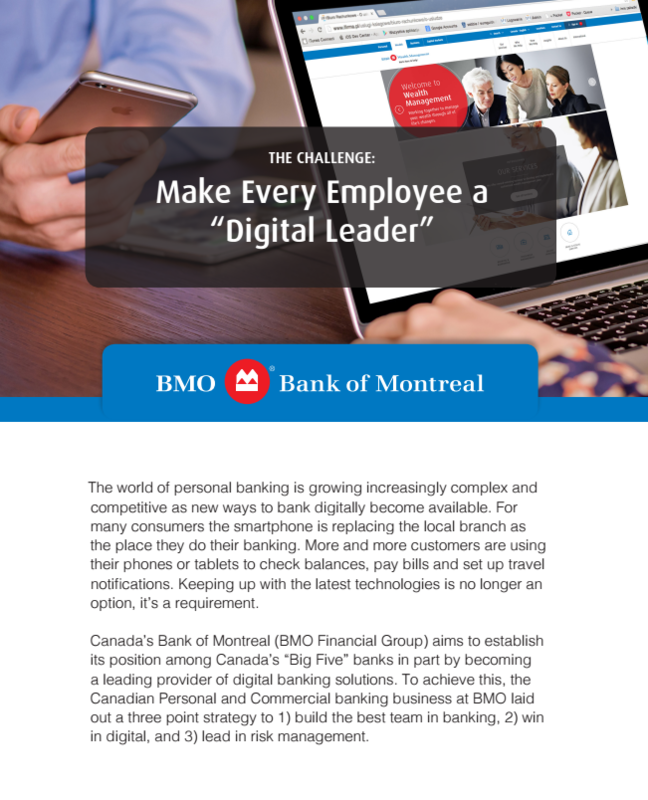 Recognizing the need for creating excitement and engagement around digital leadership, BMO took the innovative step of involving their employees in the idea generation. BMO wanted to get employees thinking about ways they can help stay ahead of the digital curve, the Digital Leader campaign kicked off with an ideation session using the collaboration platform TemboSocial Ideas. Discover the results of this innovative campaign and how your organization can follow suit to bring about the best ideas. DTE Energy wanted to educate and inform its 10,000 employees about the realities of Proposal 3 for the State of Michigan which largely misrepresented the negative financial impact the bill would have on the general public. DTE's goal was to leverage its workforce as an Army of Ambassadors to vote 'no', reaching across networks of family, friends and associates. 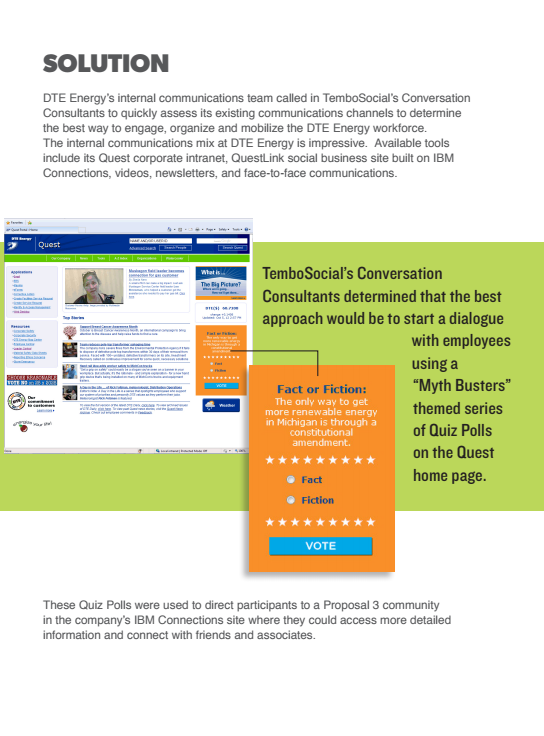 Learn how DTE leveraged TemboSocial Surveys, Forms and Polls to run a campaign of 7 "Myth Buster" Polls that brought impressive results. The RBC Blue Water Project is a 10-year global charitable commitment of $50 million to help provide access to drinkable, swimmable, fishable water, now and for future generations. 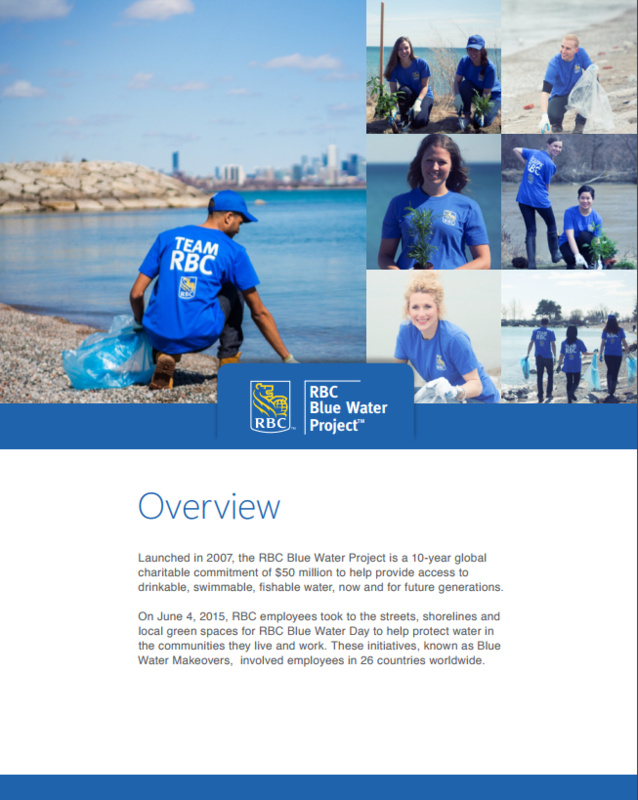 RBC aims to engage employees by giving them concrete actions to help protect water, while sustaining their interest and involvement in the RBC Blue Water Project. In 2013, the company created RBC Blue Water Makeovers to tackle both of these challenges. Learn how TemboSocial's integrated tools makes it easy for RBC to manage employee participation in this ongoing initiative. RBC hosted its recognition program in a stand-alone portal that required a separate login for employees to be able to recognize their peers. 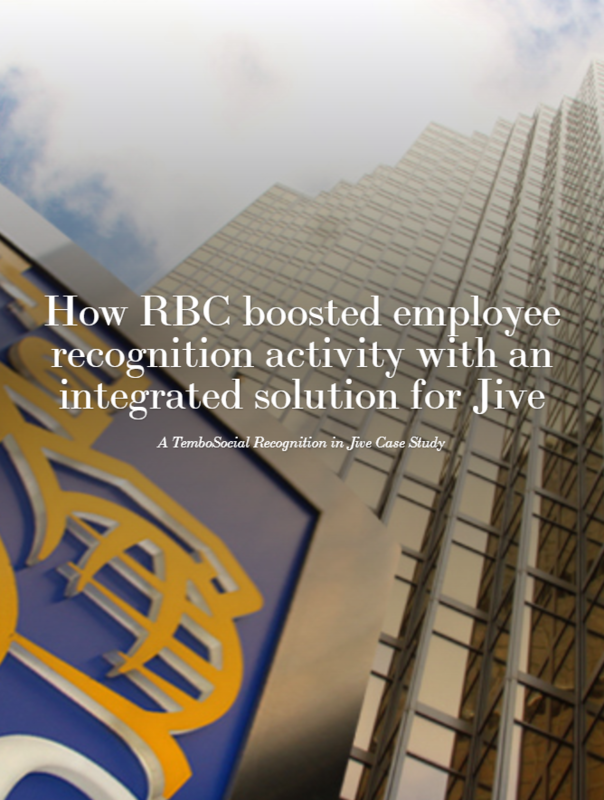 Luckily TemboSocial was able to provide an integrated recognition solution for Jive to boost participation in RBC's recognition program through a single-sign-on experience for employees. This seamless integration also allowed them to retire old legacy programs and save considerable budget as a result. Grab your copy below to learn more. 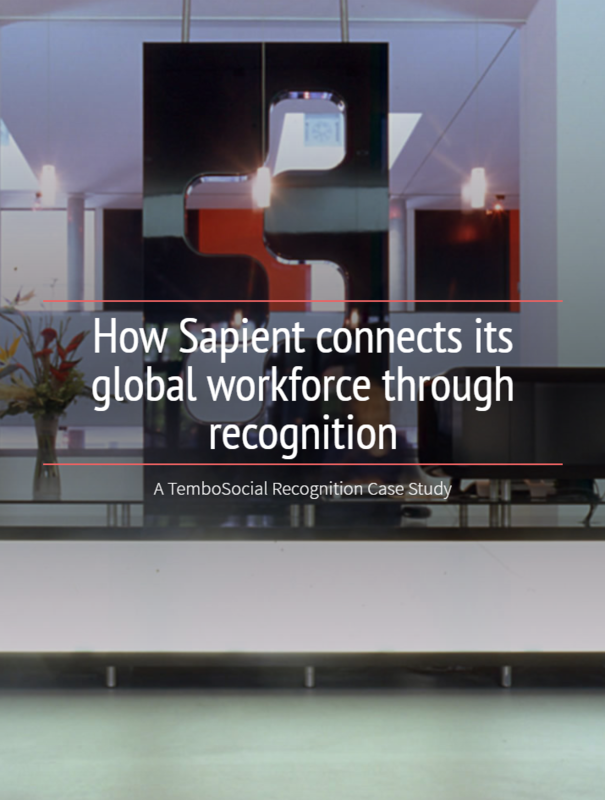 Sapient needed a tool that would connect its global workforce and encourage a culture of recognition. 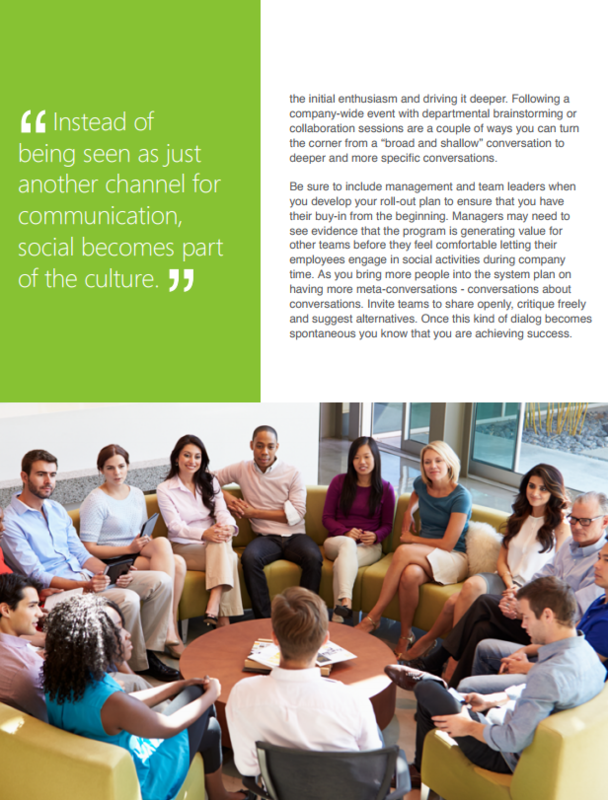 Learn how they have leveraged TemboSocial Recognition to create a connected, high-performing workforce by sharing employee successes and achievements inside its Intranet program. Software analytics company, New Relic, was looking for a visible, accessible, and easy-to-use values-based recognition program that integrates into their Jive-n Intranet program. 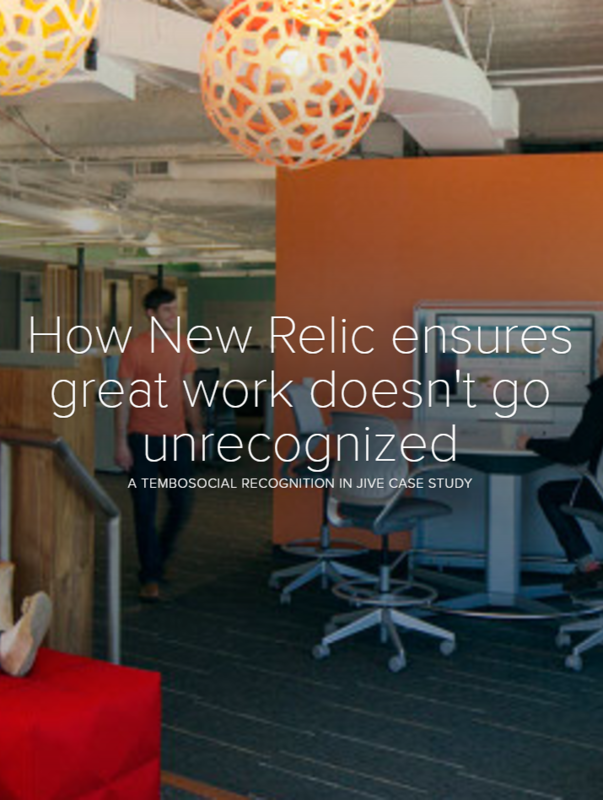 Learn how New Relic creatively promoted the launch of TemboSocial Recognition to maximize engagement and participation around recognizing great work.